Hi, I’m Ana and I’m a clinical psychologist. I started working here two years ago as a virtual tenant. That meant I could use SBC’s address which gave me a professional image in the market. I have two companies here, b.kids and b.minded. Through these companies we provide psychology programs to school students of all ages and children that visit our private practice. b.minded was also created so we can develop a brand for training products. How did you get into your small business and what did you do before? In terms of psychology practice, I had been working for other people for most of my career and it didn’t make sense anymore that I was paying other people to do the administrative work when I could do it myself. We’ve had the virtual address for two years and the dedicated office for two months now. Mainly working for other people. The moment I started thinking about working for myself I started looking at the incubators around and I really liked the price for value offered here. It’s difficult to work from home with little kids so I’ve been here from the very beginning. 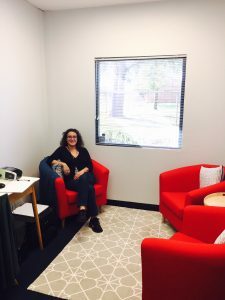 Besides living close by, I was attracted to the environment and the incubator part of the deal is fantastic for someone that is just starting a small business. Also, I really like the community and supportive aspect and the great price for the services on offer. What’s lined up for the future for your business? The development of training is something that we are starting now. The idea is to take psychology to the general public to teach them how they can do things better. We want to work with all people by teaching them neuropsychology and the positive psychology necessary to help them with things such as reaching their goals, time management, and how in a way, to hack the brain. In terms of starting a business, it’s a great starting point to stay within budget and I found it’s the best value for money to rent a room. Should we grow and need to employ more psychologists I can move on to a bigger office right here at the centre. It’s great for networking, gives us a lot of information about what’s happening in the community and training programs that are available. Oh gosh I can’t remember! It was just the weekend’s leftovers, meatballs with mashed potatoes.